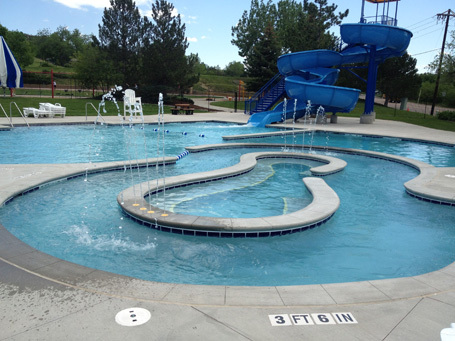 May 2012 marked the Grand Opening of the newly renovated Burgess Pool. During the last 44 years, the site has had multiple renovations and upgrades and had finally exceeded its useful life. In 2011, the town staff voted to upgrade and enlarge the pool with more family-friendly attractions, and to meet current health codes and safety issues. The $1.6 million project expanded the pool’s capacity by 60 percent and is expected to add at least 40 years to its life. Most of the old facility has been torn down and rebuilt. The new and nearly 4,000 sq. ft. pool includes a zero-depth entry, sprayers, toddler slide, current channel and underwater seating. The showpiece of the new and improved pool is a 20 ft. waterslide, which replaces the outdated 12 ft. slide. With these changes, the pool’s capacity increased from 175 to 300. The deepest water is 5 ft., making the pool enjoyable for younger children and available for swimming lessons. A funbrella and 10 tables with umbrellas will add shade to the pool deck, which was a community request. The bathhouse was also reconstructed with a new entry way, upgraded locker rooms and a new multipurpose birthday party room, which is available for rent.